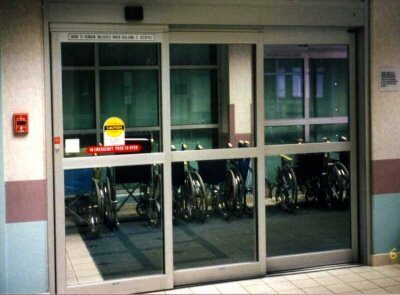 Automatic telescopic doors provide a very specific solution to a very specific problem. As automated doors are increasingly becoming a standard feature on many different types of building, more and more companies are looking to install smart, stylish and sophisticated automated entry systems of their own. This is understandable. Automated doors create an immediate impression that your firm is established, professional, and trustworthy. On top of that, providing ease of access will help ensure that your premises meet the requirements of the Disability Discrimination Act. The problem is, some buildings are so small that their facades cannot accommodate a full-size sliding door system. However, despite their limited size, these buildings may still be required to provide ease of access for wheelchairs, loading pallets, shopping trolleys, or large footfalls of people. Automatic telescopic doors provide an ideal solution where accessibility and convenience is necessary, but space is limited. Without taking up any extra room, they can provide up to 30% more opening width. Automatic telescopic doors can be designed and installed as either single or two leaf models, with two or four sliding leaves. They run on sophisticated microprocessor technology to provide many years of smooth, convenient, and reliable low-noise operation. Why Use Automatic Access for Your Automatic Telescopic Doors? Automatic Access is an independent company, and we always make customer satisfaction our number one priority. Because we have no ties to any particular manufacturers, we are free to treat every project on its own terms. When installing automatic telescopic doors, we only ever use the products and accessories that we know will be right for your specific requirements. At Automatic Access, we can plan, specify, design and install bespoke automatic telescopic doors in accordance with the latest BS EN 16005 safety standards. Our customer focused service has enabled us to develop deep and varied product knowledge of the entire automated door market, so you can expect nothing but the best from us. To find out more about how you could benefit from automatic telescopic doors, please do not hesitate to get in touch.